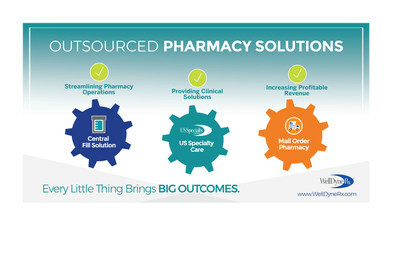 LAKELAND, Fla., /PRNewswire/ -- WellDyneRx, a full-service, independent Pharmacy Benefit Manager (PBM), is pleased to announce the launch of their Outsourced Pharmacy Solutions, a suite of turnkey pharmacy services that enable healthcare organizations to offer comprehensive clinical solutions that optimize patient care. These services allow WellDyneRx's clients to leverage the company's clinical expertise, staff pharmacists, and negotiating experience to achieve optimal clinical outcomes while containing costs. "Our Outsourced Pharmacy Solutions streamline operations for our clients while increasing profitable revenue streams," said Zach Johnson, President of WellDyneRx. "These services allow our clients to reduce their costs while taking advantage of our pharmacy resources. We manage all of the day-to-day risks and responsibilities associated with maintaining pharmacy accreditations, hiring employees, managing drug inventories, and negotiating pricing with drug manufacturers." The WellDyneRx Central Fill solution enables pharma­cies to expand their footprint beyond their physical locations to better care for their patients. Two of the largest renal care providers in the United States entrust WellDyneRx to provide Central Fill pharmacy services to their patients. Through this partnership, WellDyneRx ship over 2 million renal prescriptions over the next year. WellDyneRx's Mail Order Pharmacy gives health plans and PBMs the ability to provide home delivery of maintenance medications (medications taken for a chronic condition) mailed directly to their patients' home, work, or doctor's office. WellDyneRx's wholly owned specialty pharmacy, US Specialty Care, was named a win­ner of the 2017 Patient Choice Awards™ and a finalist in 2018. US Specialty Care offers advanced prescription services to treat complex, chronic, and often costly conditions, such as multiple sclerosis (MS), rheuma­toid arthritis, hepatitis C, and hemophilia. Health plans and PBMs can leverage US Specialty Care services to control burgeoning specialty drug costs while driving industry-leading adherence rates and optimal clinical outcomes. "Our Outsourced Pharmacy Solutions allow our clients to offer comprehensive healthcare services that lower their delivery costs. It's one more way that WellDyneRx is committed to offering solutions that truly make a difference in the financial health of our clients and the care of their members," Johnson said. To learn more about how WellDyneRx's Outsourced Pharmacy Solutions can help you streamline operations and increase revenue, visit www.WellDyneRx.com or call 855 OPS-WDRX (855.677.9379). WellDyneRx is a full-service Pharmacy Benefit Manager (PBM) that makes the little things matter for its clients, employees, partners, and members. WellDyneRx provides members with access to more than 66,000 retail pharmacies across the U.S. and mail order prescription services with the capacity to fulfill more than 15 million prescriptions per year. The company's offerings include a wholly-owned specialty pharmacy (www.USSpecialtyCare.com) that focuses on expensive specialized drugs; a national discount card program; and highly targeted pharmacy programs for Diabetes, Hepatitis C and Opioids to balance optimal clinical outcomes with minimized plan costs. Visit www.WellDyneRx.com to learn how you can optimize your health plan today.